Wow, what a weekend. Keith and I signed up for the Swampstomper 25K a couple of months ago and had really been looking forward to it. I have worked really hard to safely reintroduce running into my life since having to sit out May – August and I was pretty nervous going into this race. I knew I would go into it as a training run and nothing more since I have other things coming up and I felt more than prepared but I still started feeling my race anxiety kick in a few days ago. I have been having pretty good runs and my back pain had subsided a good bit and all of a sudden, last week it started hurting pretty badly again. I think it’s from taking some time off from working out since I’ve been fighting a cold. By Saturday morning I could barely stand or sit without pretty severe pain. Not good for my already present race anxiety. As I was standing on Cooper talking to some of my runners, I saw my PT run by. I literally ran after her to tell her about my sudden onset of pain. She is a total lifesaver and agreed to see me that afternoon…she wasn’t even working that day. I had strict instructions to go home and stretch until she called that afternoon. Well, unfortunately that wasn’t an option. We got word that Scout is missing. Scout is one of Gracie’s puppies. Gracie is the sweet dog that I helped take care of after she was found in the rain, on the streets, pregnant with 5 puppies. I spent several weeks last year going to the home of the girl who found Gracie (a girl I didn’t know at the time) to sit with Gracie and the puppies while she went to class. Needless to say, I got extremely attached. This news was a dagger to the heart. Keith and I immediately headed out to hunt for Scout. We ran into Thomas and Alli doing the same and I must say, it warms my heart to be friends with these people who will spend their days doing the same. With really heavy hearts and after about 3 hours in the car, we decided to take a break. It was then that I got the call to go see my PT. Yay, she was a complete saint to work me in on a Saturday. She needled me and poked and prodded on me until I started to feel a little better. She, again, gave me strict instructions to go home and spend the next several hours stretching. Well, as I was leaving I got word that Scout was spotted on E. Parkway. Of course I couldn’t go home and stretch! I called Keith and Alli and we all headed out again. Sadly, no luck. Home again but we just couldn’t stay there so we decided to go back out and drive the streets until it was too dark to see. Needless to say, we weren’t doing much in the way of getting ready for the race. I didn’t sleep well. Instead I thought of all the possibilities of spotting Scout on the way to the race. What would I do? Would I take her with me and have Alli come get her? Would we skip the race altogether? Unfortunately, this didn’t dilemma didn’t come to fruition since we never saw her. On to the race! I have terrible race anxiety, whether it’s a 5K or a marathon. I don’t stress about it or dread it, I just get these weird jelly legs and my insides feel like they’re filled with mexican jumping beans. It’s so weird and it’s always like this. We got to the race about 8 am- the 50k runners started at 7:30 so we missed their take off. We had just enough time to get our goodies, pin our bibs on, and stretch a bit. Perfect. Not too much wasted time and not to little to be rushed. 8:30 AM, off we went. Our “strategy” was to go slow. 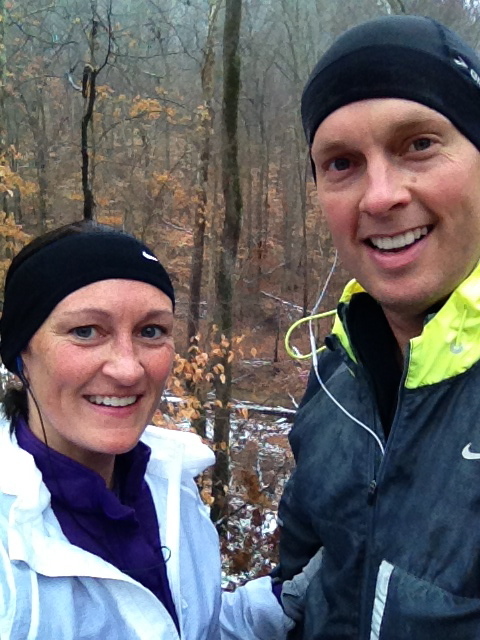 We planned to head into the woods near the back of the pack and do a run / walk. We didn’t want to race this and end up so sore that we would need to take some time off. We were also a bit nervous about the conditions of the trail since our last run out there was a big slippery mess. Much to our surprise, it was in perfect conditions- better than i’ve ever seen it! I started to get a little anxious as everyone was passing us within the first 5 minutes, before we even hit the trail. We didn’t want to fall into this trap though but, man, it’s tough not getting sucked in to other peoples run. We hit the trail 5 or so minutes in and within a few minutes, we were taking our first walk break. It was tough for the first few miles because we kept running back up on people but hated to pass them knowing that we would be walking again soon so we just stayed behind and ran their pace. After a couple of miles of this, we were definitely a little anxious to pass and get into a better rhythm. Once we did, we were able to make enough of a distance that it wouldn’t affect them when we took our next walk break. We got to the first aid station at about the time we expected. We knew the red loop was next. Ugh, the red loop. How can a 3 mile loop be so damn hard? I don’t know but it is. We stopped at the Red Loop aid station to refill our water bottles and then we were off again. Headed out of the red loop was the first time we felt like we were really finding our rhythm. I couldn’t believe I still had my mexican jumping bean jelly legs! We were over an hour in at this point. So far we had, on one run or another, been on every part of the race. Then came the big surprise. We were definitely impressed with the race and community of people running. I’ve always heard that trail runners are a bit nicer and supportive than road runners but having never done a trail race, who knows. I have run enough road races to know you run across a LOT of jerks along the way. It’s just a different vibe, a more competitive feel. We spoke to every single person that we passed or who passed us and only had 2 people not speak back. One guy, I think he couldn’t speak. He didn’t even seen capable of the ‘i’m raising my eyebrow to acknowledge you but i can’t speak’ look but I still think that’s what was going on. The other guy, well we saw him twice and he was just a jerk both times. Oh well. That’s definitely his loss. All in all, it was an awesome experience. The weather was perfect and the trails seemed as if someone had gone out there and swept them off! I wouldn’t change a single thing from the packet pick up to the shirts to the trail markers to the volunteers….and so on! Definitely a tough race and definitely one we’ll do again. Unfortunately our fun and feeling good didn’t last long as it was just sandwiched in sadness this weekend. A couple of hours after being home from the race, we got word that Scout had possibly been spotted on Union near the interstate so we headed back out last night to look for her for a while. We haven’t had any luck and it has been so incredibly depressing. I can’t imagine being married to someone who doesn’t get me and doesn’t just stand up and grab the keys when I make the comment, “a dog was spotted on Union.” We’ve spent about 6 or so hours in the car this weekend looking for her and he shares in my sadness. I owe the biggest thanks to Keith for being there for me for the highs and lows this weekend. It’s definitely been the most emotional few days we’ve had in a while, good and bad. On goes my quest for becoming a stronger trail runner and on goes my search for Scout. Memories…some happy…some sad but I wouldn’t trade them for anything. That race was a BLAST and I would highly recommend it to anyone looking for a new adventure/challenge. Kudos to the staff, volunteers and to US.